Buddhism has its roots in India. 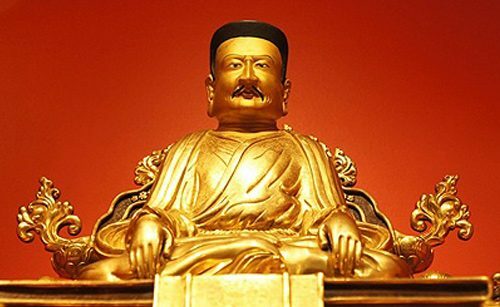 The historical Buddha gave a great variety of teachings in order to accommodate the different capacities of beings. Although he taught only orally, his early disciples recorded his instructions in writing and passed them on in their original form. Later on, Buddhist masters wrote many treatises that explain the Buddha’s teachings. The emphasis was on the authentic and accurate transmission of the teachings. Throughout the centuries, as disciples became teachers, different lines of transmission came about, each with their own characteristics. Approximately one and a half millennia after the passing away of Buddha Shakyamuni, Northern India was home to a number of great Buddhist masters, holders of many Buddhist transmissions and key instructions to accomplish meditation. Among them was the master Tilopa (988-1069), who held four special esoteric Buddhist lineages. In Tibet these were later referred to as “ka bab shi’i gyu pa”, i.e., “the lineage of the four transmissions” (“ka bab” = tradition; “shi” = four and “gyu pa” = lineage). This was abbreviated to “ka-gyu”, thus giving the name “Kagyu” to this school. Tilopa gave his special transmissions to his disciple Naropa (1016-1100). Other prominent Indian figures for the teachings transmitted in the Kagyu school were the masters Saraha and Maitripa. They were famous for their special instructions of Mahamudra and mental non-engagement, teachings which Tibetan masters later on skillfully continued to transmit until the present day. A complete transmission of these teachings came to Tibet starting in the 8th century. The Tibetan king Trisong Detsen invited two Indian Buddhist masters to Tibet – Guru Rinpoche (Padmasambhava) and Shantarakshita – and authorised the translation of the teachings from Indian to Tibetan. This was the start of the Nyingma or “Old” tradition. During the 11th century there was a second period of translation which involved the revision of earlier terminology as well as new translations. The traditions that base their transmission mainly on that period are referred to as the Sarma traditions, the “New traditions”. Of these, the Kagyu, Sakya, and Gelug are the best known. The Karma Kagyu tradition is a subschool within the Kagyu tradition. Like all Tibetan Buddhist schools, it traces itself back to Indian Buddhist masters who were active at the time when Buddhism found its way to Tibet. The Tibetan translator Marpa (1012-1097) learned in India from both Naropa and Maitripa and brought all these transmissions back to Tibet, mastered them and transmitted them to, among others, his disciple Milarepa (1052-1135). With the latter’s student Gampopa (1079-1153), the Kagyu school branched off into a number of subschools, a major one being the Karma Kagyu lineage which was named after its founder, the first Karmapa Dusum Khyenpa (1110-1193). With the recognition of Karma Pakshi (1204-1283) as the 2nd Karmapa, the first line of reincarnated lamas of Tibet came into being. Ever since, the spiritual heritage of the Karma Kagyu tradition, with its special focus on Mahamudra meditation, was transmitted through the Karmapas and the lineage holders who held the transmissions between the reincarnations of the Karmapas. from which cyclic existence and nirvāṇa emanate. What is transmitted in the Kagyu school? In the deluded minds of unenlightened beings, karmic seeds (impressions from former thoughts, words, and actions) ripen and manifest an outer world, which we believe to be real. When we really examine outer and inner phenomena, however, we find they are devoid of any inherent reality. The mind that experiences all this is itself empty — free from inherent existence. It is also luminous, since it is the basis of all appearances, and unceasing, since this emptiness and luminosity are indestructible. Ordinary sentient beings are unaware of this true nature of the mind. Instead, we mistake the natural awareness of the mind for a perceiving subject (an “I”), and the natural manifestation of the mind for perceived objects. In this way, we form dualistic ideas, which are the ground for all emotional involvements with ourselves and others. Yet despite this ignorance and its workings, mind’s true nature is always pure. It is buddha nature, unceasing emptiness and luminosity free from all afflictions and defilements. Mahamudra meditation aims at actualizing this true nature of mind, allowing the mind to settle in its uncontrived naturalness where there is, in fact, nothing to remove and nothing to achieve because it is pure and perfect in itself at all times. The essence of this practice, along with the complex tradition of philosophy, epistemology, ritual, and meditation, has been transmitted in the Karma Kagyu tradition until the present day. Lamrim is basically a gradual path, a gradual process. This gradual progression is very important for anyone who wishes to reach a destination. To understand or accomplish something, we need to go from the first to the last step. There’s a gradual path to reaching the enlightened state of mind where one is free from the two main drivers of the conditioned world: klesha, disturbing emotions — in simple terms, confusion—and causality, karma or karmic debts. The absence of confusion is clarity, and the absence of karmic debts is that we have full control; we are not driven by karma. Actually, we can influence karma instead of karma influencing us. The conditioned world also becomes conditioned in a gradual way — we don’t have sadness or crises or anything [snaps his fingers] just like that. They happen as a process. One misunderstanding after another, and on top of it, first a little bit of confusion, then judgment, and somehow in our pursuit of clearing the confusion or disturbing emotions we develop false ideas, and again more layers of confusion, and all of this becomes a habit, becomes natural to us. Buddha Shakyamuni predicted the coming of the Karmapas. Karmapa means “the one who carries out buddha-activity” or “the embodiment of the activities of the buddhas”. The Karmapas head the Karma Kagyu lineage, and have incarnated in this form for 17 lifetimes. In each lifetime, the Karmapas have demonstrated great inner achievement, in that they receive, fully realize, and pass on many esoteric teachings and practices of the Kagyu tradition and other spiritual lineages of Tibetan Buddhism, thus safeguarding the spiritual heritage of Buddhism in Tibet. It is the living experience of enlightenment that is passed on from teacher to student through direct contact and interaction which results in an inexpressible inner realization of the student. Thus the Karmapas are highly respected by all lineages. Throughout history they have also demonstrated great beneficial outer achievements such as brokering peace, curing diseases, building bridges, creating new schools of art, social activities or even changing the habits of nations. The following timeline gives an overview of the lives of some important teachers in the Kagyu lineage, all of whom were extraordinary masters who passed on the special transmissions of this school up to the present Karmapa, Thaye Dorje, His Holiness the 17th Gyalwa Karmapa. The reincarnate line of the Karmapas, and the history of the Karma Kagyu lineage that they preside over, goes back more than 900 years. The Kagyu lineage of enlightened masters that gave rise to it goes back even further. What is the Kagyu lineage? Great masters brought Buddhism to Tibet and passed it down to us over centuries in an unbroken chain of enlightenment known as the Kagyu lineage. His Holiness the 16th Karmapa was one of the greatest meditation masters of the 20th century. Find out why he was the inspiration and guide for so many people in the life of the 16th Karmapa. One of the most famous of the Indian masters of the Kagyu lineage, Naropa gave his name to the Six Yogas of Naropa, advanced meditations that are still practiced today. > Life story of Naropa.